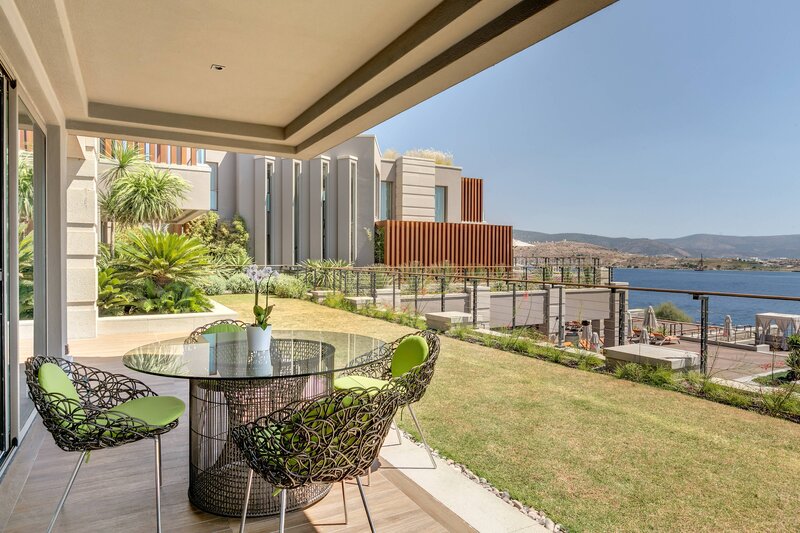 Caresse, a Luxury Collection Resort & Spa in Bodrum has 67 rooms, 9 suites and a Caresse King Villa. All rooms offer excellent amenities such as modern technology and Marriott&apos;s Signature Luxury Collection Beds. 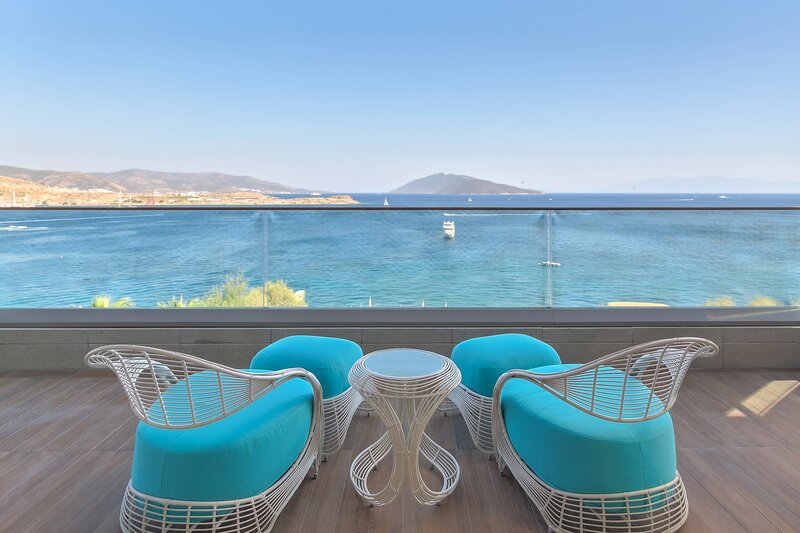 Every guest at the Caresse Luxury Collection Resort & Spa can experience the captivating view of the Aegean Sea since each room has its own private terrace or balcony. Luxury extends to a stylish blend of chic furnishings and tasteful bathrooms that epitomize the concept of lavish comfort. 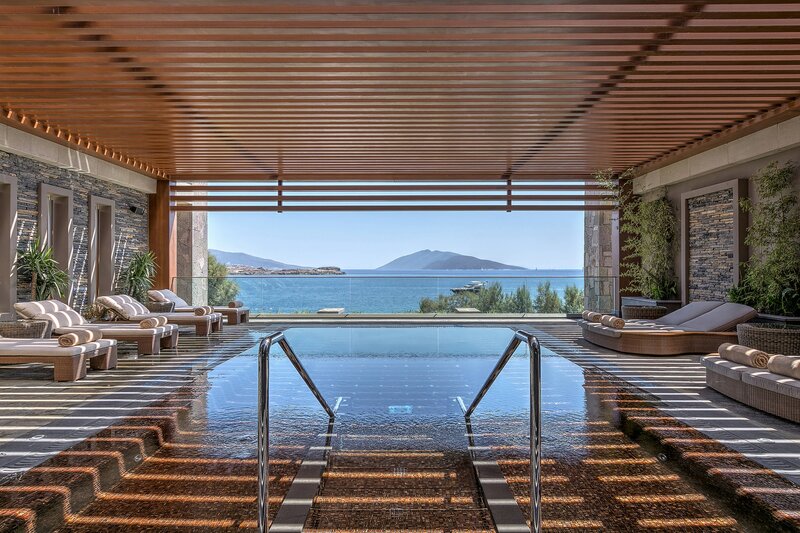 Relax, unwind and allow your senses to fully comprehend tranquility in Bodrum. In addition to this luxurious experience, our discreet and attentive guest assistant is always on hand to fulfill your every wish. For sun worshipers, an inviting infinity edge swimming pool perched above the shoreline, offers an exquisite panorama of the bay. 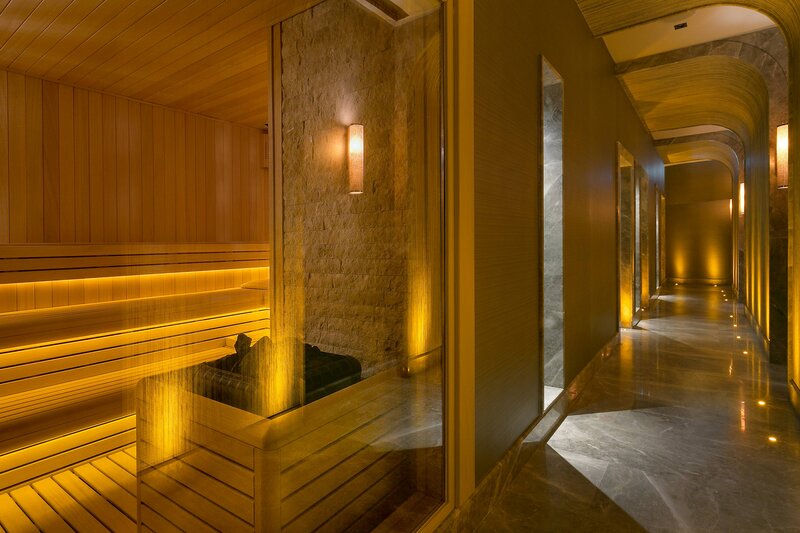 At the uniquely-designed 1,600m2 Spa Caresse, body and spirit are nourished with a selection of local and international therapies. 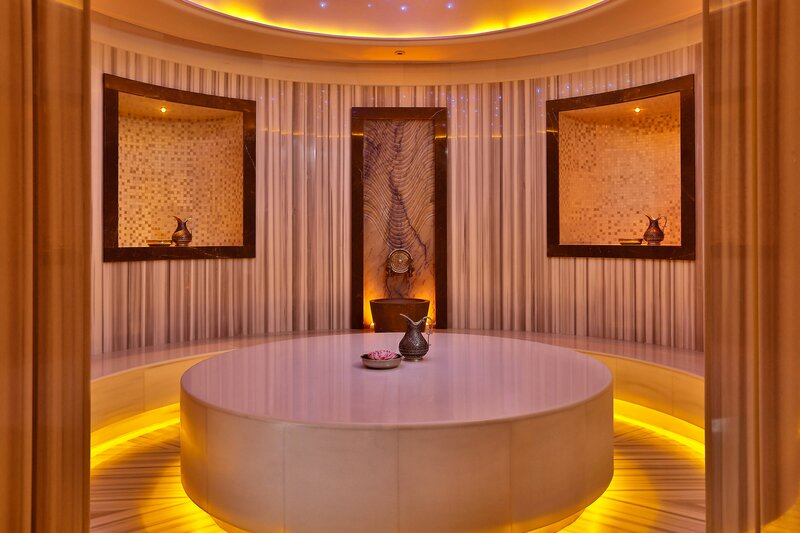 The essence of the serene Bodrum bay, pure white sands and shimmering turquoise sea sets the scene for treatments using local ingredients and the prestigious ESPA skincare range. 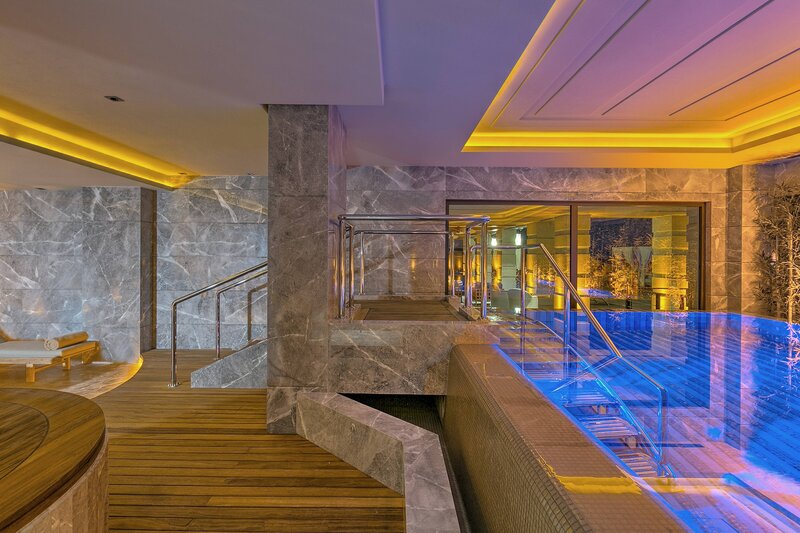 All treatments include a journey through the Spa Caresse ‘’ Degrees’’ heat experiences, spa consultation and signature welcome drink. Delight in crystal clear azure waters and soak up the sun on the private white sand beach with immaculately designed teak decks, creating a natural saltwater pool. The pure white sands and shimmering turquoise sea set the perfect scene for an outstanding holiday. 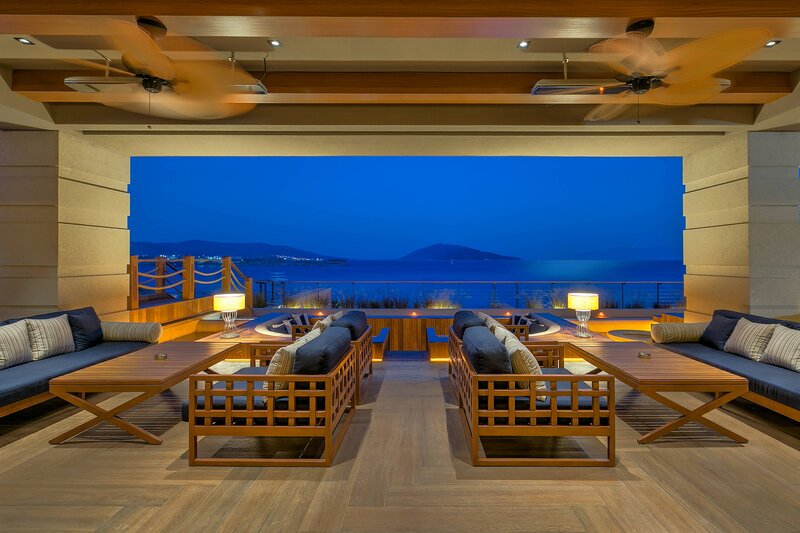 Feel the tranquil elegance of our charming Private Deck with exclusive beach access, inviting you to create unique and private events, while providing opulent, customized service, to experience unforgettable moments. 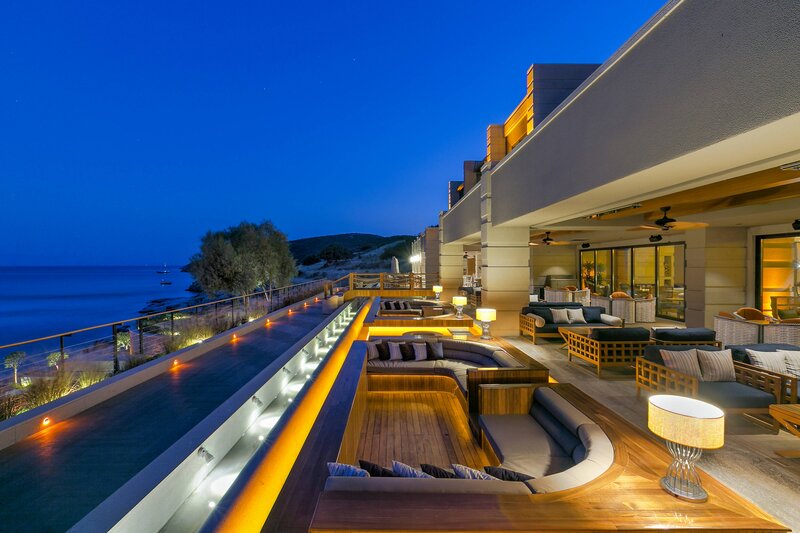 The private, white sand beach, captivating vistas and choice of elegant dining options, act as an inviting draw for guests looking to strike the balance between a quite haven and a dynamic nightlife. 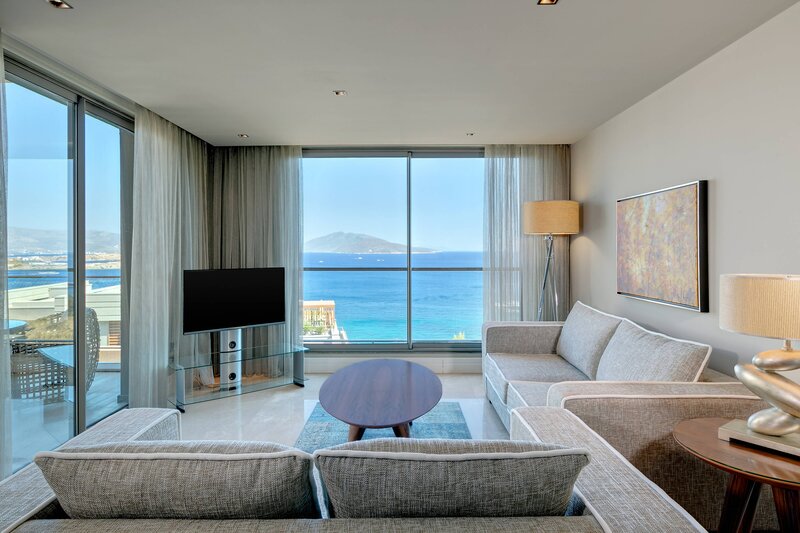 All the rooms, suites and residences offer captivating views of the Aegean Sea, with Deluxe Marine Suite 114 being one of the resort’s most valued suites. The one-bedroom accommodation features a private terrace and garden. With a romantic bathtub overlooking the Aegean Sea and direct access to the beach, the suite takes full advantage of Bodrum’s unparalleled tranquility. Guests mingle on the outdoor terrace of Glass Lounge, where sunken seating encourages socializing and acts as the perfect vantage point to watch the captivating moon rise over the peninsula. 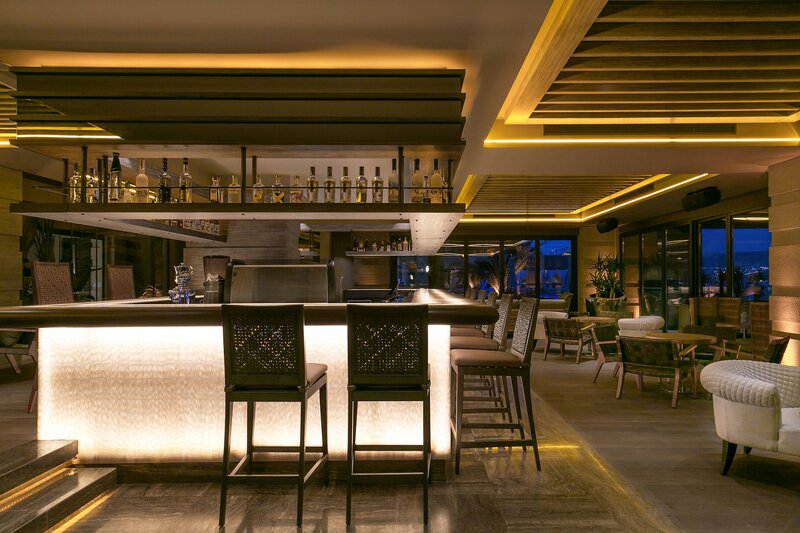 Captivating music and exceptional scenery converge at Glass Lounge & Bar, where bar food and drinks are served, alongside Caresse signature cocktails. Located in the southwestern region of Turkey, Bodrum is a tranquil port city with something for people of all ages and tastes. The 15th century Bodrum Castle features the Museum of Underwater Archeology and competes with the Mausoleum of Mausolus, one of the Seven Wonders of the Ancient World, as the city’s most popular tourist destination. With a picturesque harbor that is ideal for boating, Bodrum also features quaint stores and boutiques, authentic dining options and numerous must-see cultural attractions.